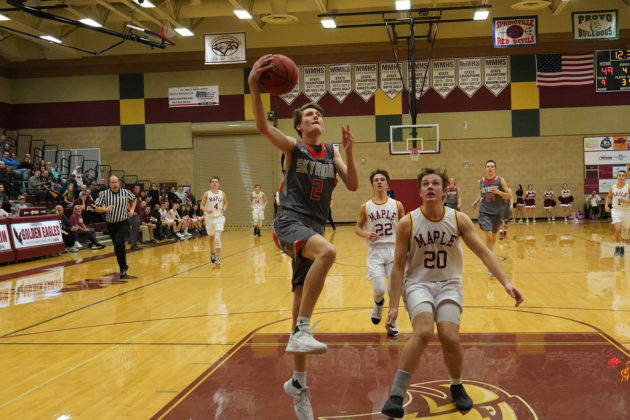 Skyridge Basketball extended their winning streak to four games on Friday night with an on-the-road victory against the Maple Mountain Golden Eagles. This was the Skyridge Falcons’ fourth region win, keeping them on top of the Region 8 standings. With their loss, the Golden Eagles fell to 0-4 in region play. Both teams came into the game with a full week’s rest. The Golden Eagles put their fresh strength to use, winning the tip and jumping out to an early 0-5 lead. But they could not contain the Falcons’ potent offense for very long. The Falcons came storming back to take a 15-12 lead at the end of the first quarter. Near the end of the quarter, Maple Mountain lost their point guard Logan Green to an arm injury. He did not return to the floor. He spent the remainder of the game on the bench, his arm eventually in a sling. Although the game was close, Skyridge clung to their lead the rest of the night. 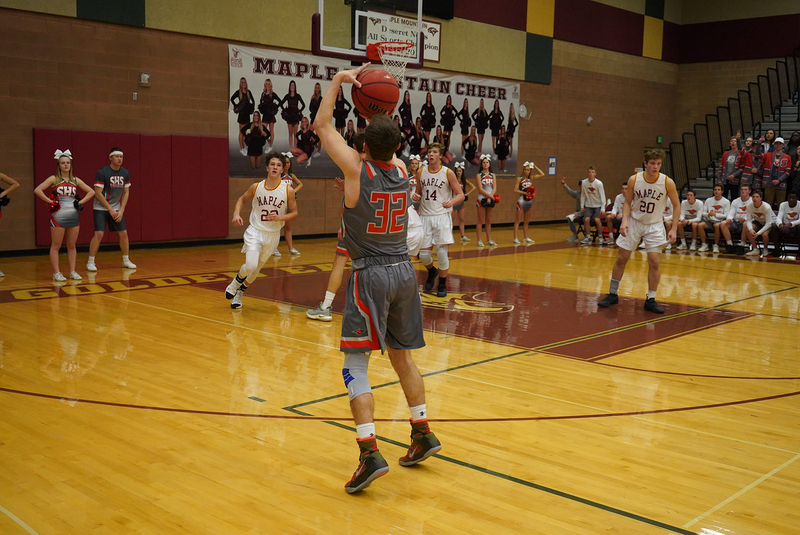 They were able to pull away by as many as seven in the first half, when sophomore Duncan Reid drained a three-pointer, despite being heckled by the Maple Mountain student section with an “airball” chant. But the Falcons were unable to extend their lead any further. 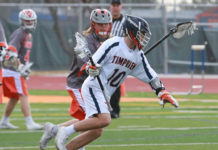 Their opponents scored the last five points of the half, cutting their seven-point lead to two. In the third quarter, Skyridge nearly saw their lead disappear when Maple Mountain’s Tyler Nelson scored a three-point shot, making it a one-point game. But Skyridge kept their composure, responding to every Maple Mountain basket with points of their own. As the quarter came to an end, they had extended their lead back to four at 39-35. The Falcons closed out the game with a twenty-point fourth quarter, showing why they lead the region standings. Maple Mountain remained within a few points of Skyridge for most of the quarter, but as the end of the game approached, the Falcons’ lead grew. 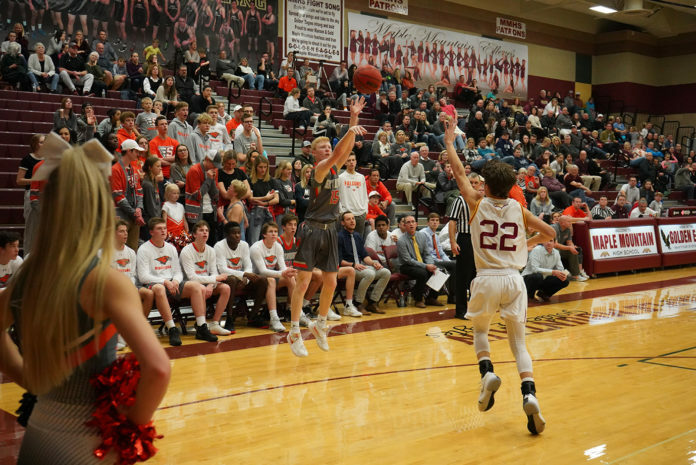 Falcon Senior Captain Braden Allfrey’s experience was on display, as he scored key free throws down the stretch to maintain a comfortable Skyridge lead. The final score was 59-49. 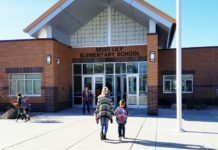 Skyridge plays again this week, with one game at home against Springville High School and one on the road against Provo High School.